Yes, they really open from the bottom. It’s hard for me to express how much this offends my aesthetic sensibilities. Just put the label on the other way around, man! Ah, the dolma. It’s easy to over look the Greeks as purveyors of strange delicacies, but the dolma is certainly that. It’s rare, outside of Asia (and, I suppose, salads), to be fed straight up leaves as food, yet that is precisely what a dolma is – a broad, boiled grape leaf rolled into a tube and stuffed with seasoned rice. The dolma is something of an acquired taste thanks to an interesting mingling of flavors. Like any local, traditional dish, the stuffing of a dolma can vary dramatically from region to region. Most commonly, however, you’re going to find them looking like the Trader Joe’s variation here – with plenty of dill and mint mixed into the rice. Dill and mint are not two tastes that are generally thought to go together very well, justly I might add, and complicating matters further is the grape leaf itself. Something of the wine-ness of the grape is also present in the grape leaf. Even after being boiled and stored in oil for god knows how long, the grape leaves have a subtle but lingering wine-like taste that muddles into the dill and mint scrap up. Essentially, a dolma is a tiny flavor battlefield where different flavors keep coming out on top. The amazing thing is this is one of those flavor combinations that actually works, making for a fascinating side dish and excellent compliment to tzatziki sauce. I’ve only had a few experiences with domas before now – one particularly favorable memory involving a nice Greek salad – so I was game to try them again when Trader Joe’s presented me the chance. This initial willingness was first checked when I picked up the tin they were packaged in. I have very few iron-clad eating guidelines, but one of them is not to neat anything that comes packaged in a sardine tin. I was willing to bend that rule this one time based solely on my regard for the Trader Joe’s name – so much have I come to respect this gentle, supermarket giant. No sooner did I peel back the metal tab on top (or bottom, strangely) of the dolma tin then did I regret making this exception. Trader Joe’s dolmas look positively unappetizing – shimmering, glistening leaf rolls swimming in the viscous soybean oil which fills the canister to the brim. Soybean oil is just straight vegetable oil – which is to say, it’s 100% pure liquid fat – and while I understand that soybean oil is, in some ways, more healthy than other vegetable oils, I also know that no food should be served in so much oil that it makes Dubai look poor. The taste of the dolmas themselves was more or less on target – but the texture and execution turns them from something I should enjoy snacking on into something I had to force myself to eat. The soybean oil completely permeates the dolma, bloating every grain of mushy rice with pure oil and running off the leaf to pool on your plate. 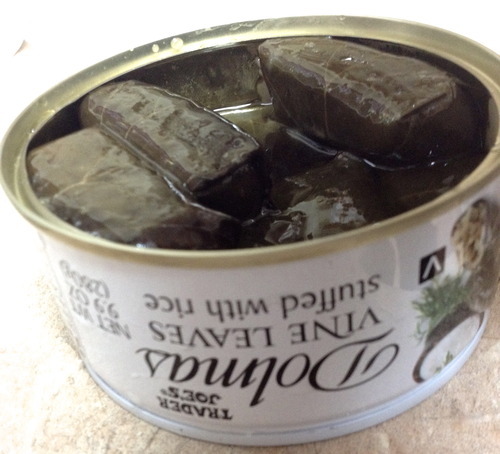 Combine this with the no-frills, low-quality, upside-down tin and you’re left feeling like you’ve just picked up something from the bottom shelf of the off-brand supermarket. From the weird tin to the copious use of oil, this just doesn’t feel like a Trader Joe’s product. It’s well known that Trader Joe’s sources nearly all their offerings from various manufacturers around the world, but in general the quality is so uniformly high that I never think twice about it. It’s only when I pick up something like this that the illusion starts to show at the seams and I suddenly get a vision of the crappy factory in Turkey where leaf rolls are dumped off a conveyor belt into tins alternatively marked Trader Joe’s and Tesco. Dolmas are great and delicious, and I’d recommend you try them sometime – just not here, not like this. Would I Recommend Them: To Eastern European grandmothers who grew up during the Cold War and other people who don’t mind oil-packed, tinned foods, yes. To everyone else, no. Would I Buy Them Again: No, There have got to be better dolmas than this out there. Final Synopsis: A tasty dolma brought low by a cheap, oily presentation.